Our Bank has introduced “Banking on Wheels” which is the first in the History of Banking in India. 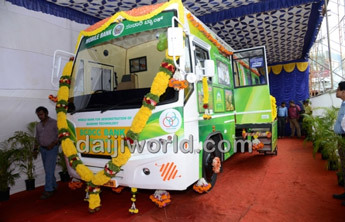 Ashok Leyland ecomet 1212 Vehicle is used specially designing for our Bank on Wheels Project. It is well furnished with AC System, ATM, Customer Counter, Manager Cabin and light music and it is well equipped with Three Computer Systems, UPS System, and Printers. A hidden camera is installed to provide security for the Mobile Bank. The data is transferred through wireless modem. In each counter there is facility of safe lockers to keep the pledged jewels and cash received from the customer and there is separate Defender Safe in the Mobile Bank to keep the jewels and cash received from the customers. 1. Mobile Bank is the Extension of our Kodialbail Branch. All the Banking transactions done in Mobile Bank are directly connected to Kodialbail Branch. All types of works like Debit, credit, issue of D.D, FD, Jewel Loan, all personal Loans. 2.00 PM to 5.00 P.M.